Madness descends on Venezuela. This is heavy stuff. Socialist thugs are now going to try to snuff out the last traces of freedom from that unfortunate country. 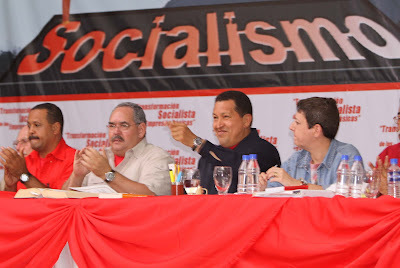 August 8, 2009 -- On August 1, United Socialist Party of Venezuela (PSUV) members across the country participated in 1556 local assemblies to discuss the reorganisation of the party’s base into local ``patrols''. This push to strengthen revolutionary organising comes at a time when attacks on Venezuela’s revolutionary process revolution “from outside and within have intensified”, Venezuelan President Hugo Chavez, also president of the PSUV, said on August 4. After his re-election in the December 2006 presidential elections, Chavez issued a call to build a “new party… from the base” and at the service “of the people and the revolution, at the service of socialism”. As an expression of a deeply felt need for greater revolutionary unity, almost 6 million people enrolled as aspiring PSUV members between April and June, 2007. Organised into 300-strong local battalions, several hundred thousand aspiring members embarked on the task of building the PSUV, which held its founding congress in early 2008. However, a national leadership handout distributed at the assemblies said the process of forming battalions had generated “a number of logistical difficulties [that meant] grassroots participation in the battalion meetings profoundly diminished, and in doing so debilitated [their] functioning and political performance”. Drawing on the lessons of previously successful election campaign structures, the leadership announced a re-organisation of the bases, where activists who know each other and live in the same street, block or local community were to unite into patrols comprising 20 to 30 members. The smaller size and self-selecting nature of the process aims to facilitate greater organisational capacity and cohesion. It is expected between 100,000 to 200,000 patrols will be formed in the lead up to the PSUV’s second national congress, scheduled to begin on October 10. Despite announcements by Jorge Rodriguez, head of the PSUV’s national organisation commission, that patrols would only be organised on a territorial basis, representatives of the PSUV’s Socialist Workers Front told Green Left Weekly that Chavez proposed they move ahead with forming factory- and workplace-based patrols. PSUV Youth members have also said they plan to form university and high school patrols. Despite more than 60% of the 1.5 million new members who signed up this year being below the age of 29, youth participation in the assemblies was extremely low. On the political front, activism in local communities and ideological formation was emphasised. The PSUV leadership document (see below), circulated for discussion at the assemblies, said this was crucial for “accelerating the transition to socialism”. The document said this transition involved “the transformation of the bourgeois state into a revolutionary and democratic state ... the creation of socialist property relations over the means of production ... [and] the creation of revolutionary consciousness in working people [through] a profound ideological and cultural revolution”.